The number of students studying the humanities at the University of Washington is shrinking, with some majors down as much as 50 percent in a decade. It's having a financial impact, and also affecting the breadth of the university's expertise. Its history department has no scholars on the history of ancient Greece and Rome, and it may stop teaching Sanskrit, the ancient language of India and the root of many other languages. The gaps in the school’s faculty might sound jarring, but it’s the outcome of a decadelong trend. Ever since the recession, parents and educators have encouraged students to major in subjects that lead to high-paying jobs, where employment opportunities are seemingly endless. But that swing to STEM is having unexpected consequences. With fewer students studying the humanities — history, philosophy, foreign languages and English — those departments are shrinking. Retiring professors aren’t replaced. The liberal-arts decline is making the university financially poorer, too. That’s because it’s cheaper to teach a history class than a computer-science course — but the UW charges the same for both. 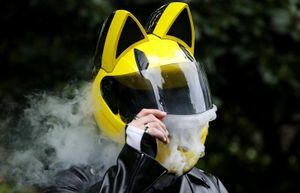 In effect, the humanities courses have always subsidized engineering, natural sciences and computer-science classes, said Sarah Hall, vice provost of UW planning and budgeting. When humanities enrollments decline, the budget is thrown out of whack. Last year, entering freshmen came in with about 200,000 credit hours. In a given year, the entire UW Seattle faculty teaches about 1.1 million undergraduate credit hours overall. The double whammy of fewer students studying humanities and more students coming in with college credit is playing out across the state and nation. The number of history majors nationwide is down about 45 percent from its peak in 2007, and the number of English majors has fallen by nearly half since the late 1990s, according to research by Benjamin Schmidt, an assistant professor of history at Northeastern University who has been documenting the trends. 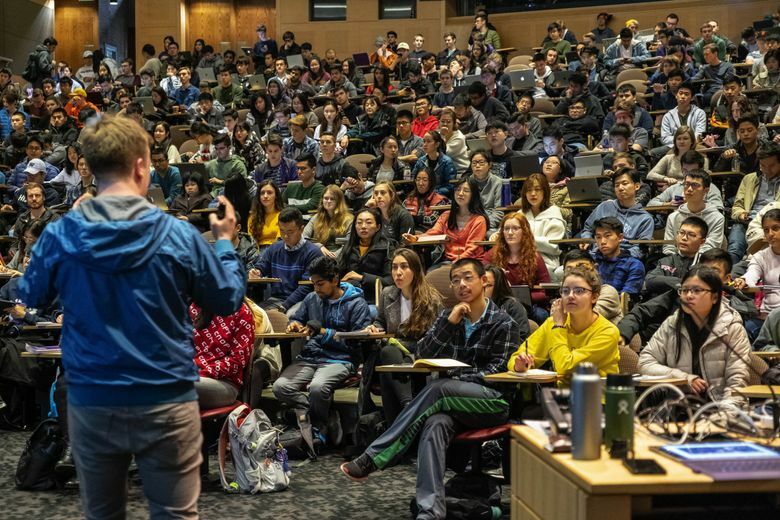 Since 2008, on the UW’s Seattle campus, the number of students studying in STEM programs (science, technology, engineering and math) has increased 37 percent. Among all three campuses, it’s up 50 percent. On the main campus, non-STEM programs have declined by 13 percent. At UW Seattle, there are now almost as many students studying in STEM programs as in non-STEM programs. That’s a dramatic flip: Just 10 years ago, there were twice as many students in non-STEM majors as there were in STEM majors. Other Washington universities have seen growth in STEM as well. Washington State University has seen STEM undergraduate majors skyrocket by 17 percent in five years; all other majors grew by just five percent. At Western Washington University, the College of Humanities and Social Sciences has almost exactly as many majors as it had a decade ago, but last year awarded 33 percent of all bachelor’s degrees to high-demand or STEM fields. Five years ago, those majors made up 29 percent of bachelor’s degrees. The shift away from humanities doesn’t bode well for her education’s financial future. Encouraging more students to go into high-earning fields will only make college costs grow, according to a working paper released in November by the nonprofit National Bureau of Economic Research (NBER). Nationally, it costs an $410 per credit hour to teach electrical engineering, one of the most expensive majors. Sociology, one of the cheapest-to-teach subjects, costs less than half of that — about $176 per credit hour. While the NBER study of 522 colleges and universities didn’t include UW figures, the costs are roughly similar, said Hall, the vice provost. Educating a UW engineer costs twice as much as educating a UW English major. Why are science and tech courses so expensive to teach? Salaries are a piece of the puzzle: Someone with a doctorate in computer science can make a handsome salary in the private sector, so he or she commands a high salary in academia. Upper-level courses in engineering, the natural sciences and computer science are also typically taught in smaller classes stocked with high-tech equipment — which makes them more costly. And one of the biggest expenses is hiring new science or technology professors as those majors grow. The university has to set a new professor up with a lab and fund graduate students, who are paid a salary, to work in that lab. In the sciences, the startup costs alone to hire one professor can run $1 million or more, Stacey said, whereas a humanities professor doesn’t need a lab. In many states, public universities charge extra for majors that are costlier to teach. But by law, Washington public colleges and universities can’t charge different prices, Hall said. The UW charges a flat-rate tuition based on a student’s residency ($11,207 for in-state students on the Seattle campus this year, including all fees), no matter what they’re majoring in. Everyone gets the same bill, whether they’re majoring in philosophy or electrical engineering. It’s easy to read about the migration to tech fields and shrug. After all, doesn’t it simply reflect reality — that graduates have better job prospects if they study tech or business? Humanities professors disagree. They say it’s a myth that humanities majors can’t find jobs, and it’s disappointing that so many people are discouraged from pursuing their passions. Along with history, English has taken one of the biggest hits; English majors have declined at the UW Seattle by 50 percent in the last decade. A shrinking English department impoverishes the UW in other ways, says Eva Cherniavsky, a professor of American literature and culture at the UW. For example, the English department now admits about 10 to 12 doctoral English students a year — only as many as can be funded through teaching positions (known as TAs) and fellowships. The humanities departments can’t offer large-enrollment lecture courses because there aren’t enough TAs to staff them, Cherniavsky said. English professors will be expected to teach about 200 students a year without TA support. That schedule means Cherniavsky will have little time to do original research, making the job more like a community college position than a tenured professor’s role at a major research university, she said. But Cherniavsky rejects the idea that the humanities are dying a natural death. She thinks they’re being “purposefully decommissioned” as part of a decades-long effort to strip the humanities of funding and use that money for other parts of the university. It’s not true, Cherniavsky says, that there’s no job market for graduates who can write, do critical analysis or have the ability to view knowledge from diverse ethnic and cultural perspectives — a concept known as multicultural literacy. “It’s not that the corporate world has no use for these skills,” she said. Instead, companies tend not to pay much for the jobs that require them, she said. The UW has created a special advising group, the Center for 21st Century Liberal Learning, to help students translate what they’ve done in college into a description of skills that are meaningful to employers. For example, advisers help students explain how doing research using a wide variety of sources and then pulling the information into a compact, persuasive prose form could be useful in a business setting. Both Microsoft and Amazon offer mentorships exclusively for College of Arts & Sciences majors. “We are using these programs not as recruitment tools, but as myth-busting,” said Matt Erickson, manager of college-to-career initiatives in the College of Arts & Sciences. Erickson said the UW is sometimes guilty of reinforcing the idea that only STEM degrees lead to good jobs in Seattle. 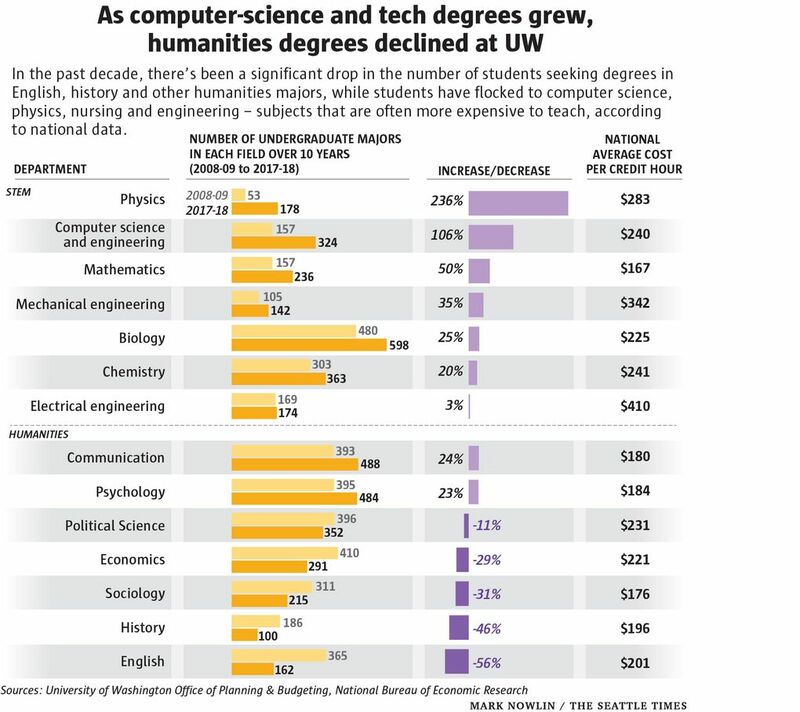 But UW humanities majors have found jobs at every big tech firm in Seattle — including majors in history, English, art history, sociology, German, French and linguistics. They’ve found roles in human resources, community engagement, customer outreach and marketing, he said. To fix at least the budget part of the imbalance, Gov. Jay Inslee has proposed giving the UW an additional $26 million in “foundational support” — largely for salaries — in 2019-21, for the university’s core operating budget. Under that proposal, the UW and the state would be splitting the cost of salaries 50-50. (In the last budget, the state paid 33 percent of professors’ and other employees’ salaries and the university paid 66 percent.) 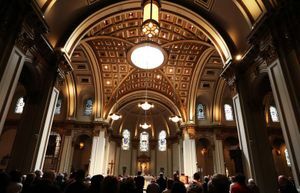 The total biennial budget request is $824 million, up $100 million from 2017-19. Stacey, the Arts & Sciences dean, worries that the UW, which just last year landed toward the top of Reuters’ list of the world’s most “innovative” universities, will become seen as a school for science, and not a place where students go to study the humanities. He believes there’s a danger in getting a college degree that focuses too narrowly on one set of skills. In the early 2000s, during a boom in energy production in the U.S., petroleum engineers were in high demand — and those graduates did well. But, Stacey said, when that sector of the economy bottomed out, those same engineers had a hard time finding a job. “So much of the perceptions (about job prospects) are based on the wrong information, or very shortsighted information,” said Stacey. Even philosophy can pay off, as people turn to that field to help make sense of society’s relationship with technology. Recently, a UW-led team of philosophers received a $1.5 million grant from the National Institutes of Health to study how brain-computer interfaces affect whether patients with high-tech prosthetics feel they are in charge of their own actions. Correction: An earlier version of this story incorrectly said the university had no scholars on the history of ancient Greece and Rome. It is the UW’s history department that no longer has professors who are experts on the history of ancient Greece and Rome. Also, although the UW is teaching Sanskrit through the end of this year, it is not clear if it will be offered in the future.